When you draft your speeches you aim to get the best possible result. But have you considered how much time and effort you spend on the language? That is, the language you use for effective public speaking? Of course, it’s no small matter. When you use the best possible language you can expect better public speaking results. That’s because your audience can put all their focus into your ideas and suggestions. Use the active tense when you speak in public. Take possession of your subject. Exude authority with the active tense. For example, use “I will” or “We will” instead of “I would” or “We would.” The passive tense does not suggest responsibility, ownership or urgency. Just take a look at this Angolan President speech for an example of how not to do it. Avoid jargon and acronyms. If you have to use acronyms then take care to spell them out properly the first time you use them. Consider doing it again as a precaution. It’s because you can’t be assured that everyone in your audience will know your acronyms. Or, worse still, they might have a wildly different understanding of the same acronym! This Caroline Spelman speech was of course littered with jargon and was poorer for it. Use short words. The shorter the better. You are more likely to make a verbal trip or mispronunciation with long words. So, edit long or tricky words out of your speech. Practise the proper nouns when you rehearse. Last, think about highlighting them in your speech. Use short sentences. Short and concise sentences are easily heard and understood by your audience. Sub-clauses and dependent clauses require concentration. Yours and your audience’s. Barack Obama managed it with a 45 word “If” clause in his Presidential Election speech in November 2008. But the Archbishop of Canterbury didn’t quite have the same impact with his mis-reported “Sharia law” speech in February 2008. And, the Bahrain Kings speech in 2012 was equally impenetrable. So, when it’s time for your speech you want your audience to focus on you and your speaking. When you focus on your language you know that your audience will focus on what you have to say. Solid and uncluttered language helps their active listening, understanding and memory of your speech. And that’s the right course for effective public speaking. 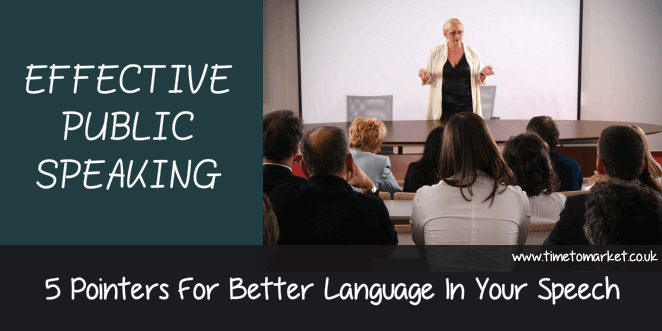 Your choice and use of language will typically have a major impact on your effective public speaking. So, here are 5 top tips to help you make the most of your language when you give a speech. Use the active tense when you speak. Aim to use common language that’s going to be familiar to your audience. Avoid jargon and acronyms because they don’t work in a speech. Prefer short words to long words. Again, people find them nmore familiar. Deliver your speech with short sentences. You can learn more about effective public speaking with a public speaking course from Time to Market. We run public courses at more than 40 training sites which means that you are never that far from your nearest course. As an alternative, you can always organise a corporate training day for your team or one-to-one coaching for yourself.